You could call home whenever you wanted to if you had the travel adapter for the USA because the battery is always charged. It is ideal if you regularly travel to countries using the American mains socket standard. You can use this travel adapter to connect all your 2- and 3-pole devices with Schuko or Euro plugs when you're there. It doesn't just mean that your mobile is always fully charged, you will be able to plug in your iron, electric toothbrush and camera as well. Can't live without USB? The Euro USB Charger is compatible with all the Country Adapters. Has your device got another plug standard? Check out our World- and Combo-versions. 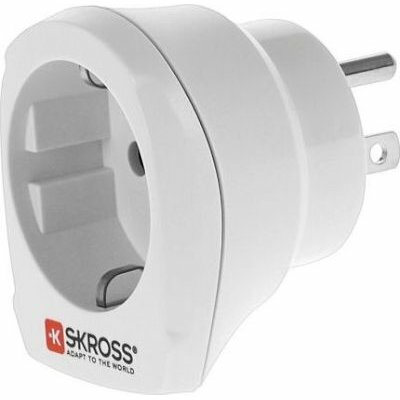 Just as all products from SKROSS, the country travel adapters are also made in familiar high Swiss quality and comply with all the relevant international safety standards in and, of course, are certified and Patented.